Araya R, Rojas G, Fritsch R, Gaete J, Rojas M, Simon G, Peters TJ. Treating depression in primary care in low-income women in Santiago, Chile: a randomised controlled trial. Lancet. 2003 Mar 22;361(9362):995-1000. Bolton P, Bass J, Neugebauer R, Verdeli H, Clougherty KF, Wickramaratne P, Speelman L, Ndogoni L, Weissman M. Group interpersonal psychotherapy for depression in rural Uganda: a randomized controlled trial. JAMA. 2003 Jun 18;289(23):3117-3124. Dhanda A, Narayan T. Mental health and human rights. Lancet. 2007 Oct 6;370(9594):1197-1198. Engle PL. Maternal mental health: program and policy implications. Am. J. Clin. Nutr. 2009 Mar;89(3):963S-966S. 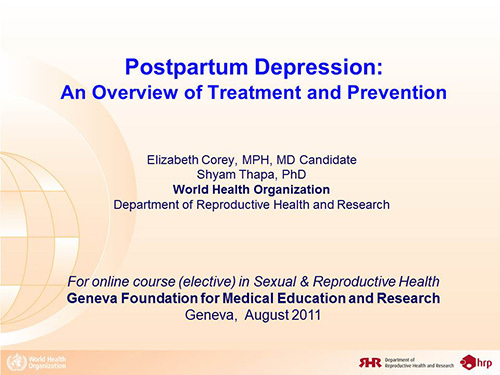 Fitelson E, Kim S, Baker AS, Leight K. Treatment of postpartum depression: clinical, psychological and pharmacological options. Int J Womens Health. 2010;31-14. Kessler RC, Andrews G, Colpe LJ, Hiripi E, Mroczek DK, Normand SLT, Walters EE, Zaslavsky AM. Short screening scales to monitor population prevalences and trends in non-specific psychological distress. Psychol Med. 2002 Aug;32(6):959-976. Nazareth I. Should men be screened and treated for postnatal depression? Expert Rev Neurother. 2011 Jan;11(1):1-3. Patel V, Araya R, Chowdhary N, King M, Kirkwood B, Nayak S, Simon G, Weiss HA. Detecting common mental disorders in primary care in India: a comparison of five screening questionnaires. Psychol Med. 2008 Feb;38(2):221-228. Patel V, Araya R, Bolton P. Treating depression in the developing world. Trop. Med. Int. Health. 2004 May;9(5):539-541. Patel V, Chisholm D, Rabe-Hesketh S, Dias-Saxena F, Andrew G, Mann A. Efficacy and cost-effectiveness of drug and psychological treatments for common mental disorders in general health care in Goa, India: a randomised, controlled trial. Lancet. 2003 Jan 4;361(9351):33-39. Rahman A, Iqbal Z, Harrington R. Life events, social support and depression in childbirth: perspectives from a rural community in the developing world. Psychol Med. 2003 Oct;33(7):1161-1167. Rahman A, Malik A, Sikander S, Roberts C, Creed F. Cognitive behaviour therapy-based intervention by community health workers for mothers with depression and their infants in rural Pakistan: a cluster-randomised controlled trial. Lancet. 2008 Sep 13;372(9642):902-909. Rahman A, Patel V, Maselko J, Kirkwood B. The neglected “m” in MCH programmes--why mental health of mothers is important for child nutrition. Trop. Med. Int. Health. 2008 Apr;13(4):579-583. Stewart DE, Robertson E, Dennis CL, Grace SL, Wallington T. Postpartum depression: Literature review of risk factors and interventions. Toronto Public Health, 2003. Surkan PJ, Kennedy CE, Hurley KM, Black MM. Maternal depression and early childhood growth in developing countries: systematic review and meta-analysis. Bull. World Health Organ. 2011 Aug;89(8):608-615E. World Health Organization. Maternal mental health and child health and development in low and middle income countries. Report of the WHO-UNFPA meeting held in Geneva, Switzerland. 30 January- 1 February 2008.
Review existing policies and programs, if any, in PPD in your country and prepare a summary. Conduct a literature search on what research, if any, has been conducted in the country you are interested in and prepare a short summary of the findings. Review the attached article on cognitive behavior therapy-based interventions by community health workers for mothers with depression, and prepare a commentary on what aspects of the interventions could be feasible and acceptable to implement as a pilot project in your own community. Suppose you are planning to do a post-intervention evaluation only of the pilot project. Propose a plan for evaluation of what worked and what did not the community-based pilot project. Consider conducting formative research in your community to determine local awareness of PPD, local terms used to describe PPD, and current treatment for PPD.